In 2019, 110 years have passed since the adoption of the Danglis-Schneider mountain cannon for the use of our army. Despite the foreign name, the mountain weapon was produced at Russian factories and for many decades served faithfully at first, the tsarist and then the Red Army. The unique 76-mm mountain cannon of the French Dangliz – Schneider system, model 1909, was developed for the Russian Imperial Army. The guns, capable of conducting effective aimed fire in the mountains, were very necessary for her. Tactical and technical requirements for a new weapon developed by the beginning of 1900. In the same year, the Main Artillery Directorate offered to manufacture samples of mountain cannons to the leading world manufacturers – Krupp, Saint-Chamonon, Schneider firms, as well as Russian plants – Obukhovsky and Putilovsky. Of the samples submitted to the finals of the competition came the mountain cannons of the French Dangliz – Schneider system and the Austrian company Skoda. The best was recognized by the French gun. 110 years ago it was adopted by the Russian army under the designation “76-mm mountain cannon of the model of 1909”. The gun was intended for the destruction of enemy manpower, the destruction of defenses and light shelters, the fight against mechanized equipment and artillery of the enemy. It was used in operations in the mountains, on rugged and difficult terrain. Guns were towed on wheels or transported unpacked by pack horses. The design of the gun made it possible to fire in the mountains with large angles of vertical shelling. 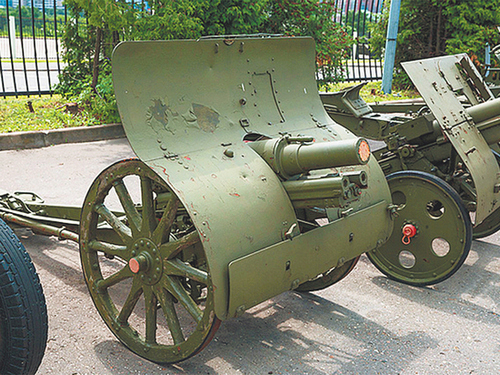 Produced mountain cannons from 1909 Putilov factory. In 1910, the St. Petersburg Gun Plant joined them. Until 1914, they placed a little more than 1,250 guns in the army. During the First World, mountain cannons were used in battles on the South-Western Front and in the Caucasus against Austro-Hungarian and Turkish troops. Red Army mountain cannons inherited from the imperial army. In the 1920s, their production continued at the Petrograd Plant, which was evacuated to the village of Podlipki, Moscow Region. Subsequently, the production of guns started in factories number 92 (Gorky, now Nizhny Novgorod) and number 172 (Perm). In total from 1924 to 1939 the Red Army received 756 mountain cannons. They entered service with artillery regiments of mountain rifle divisions. The guns had to be fought in various local conflicts, as well as in the battles of the Great Patriotic War. By June 22, 1941, 1121 mountain cannon of the 1909 model remained in service with the Workers ‘and Peasants’ Red Army. You can see an artillery veteran today, for example, in the Victory Museum on Poklonnaya Hill. This gun, built at the factory number 92 in 1933. Until 1995, it was stored together with other guns in one of the arsenals.